Welcome to Kay’S Kabin! This Brand New Gem is Tucked Away in Wooded Seclusion in Suches, GA Known as “the Valley in the Clouds.” Located Just Off Wolf Pen Gap Road and Highway 180 This Classic Log Cabin Design Features a Beautiful Floor to Ceiling Natural Stone Fireplace with Gas Assisted Start, Hardwood, Travertine and Slate Flooring, with Hand Etched Slate Shower Design. Vaulted Ceilings, Warm Pine Walls, and Large Windows that Bring the Outdoors to You as You Relax and Enjoy the Seclusion in the Mountains While Enjoying the Luxurious Amenities that Surround You. Put on Your Hiking Shoes and Walk Off the Front Porch and in a Matter of a Few Steps You Will Find Yourself Surrounded by Living History as You Stroll Down the Appalachian Trail. Less Than a Mile from the Cabin is Lake Winfield Scott Which Offers Fishing, Canoeing/Kayaking, Featuring a Scenic Lakeside Beach to Kick Back and Enjoy the Sunshine. If Fishing is Your Pleasure Then Try Your Hand at Trout Fishing in Cooper Creek. when You Return Take Some Time to Kick Off Your Shoes and Relax in the Cool Shade of the Covered Porch as You Enjoy the Porch Swing and Rocking Chairs or Take a Short Stroll Down to the Spring Fed Trout Pond Where You Can Listen to the Trees Sing and Watch the Clouds Roll by. 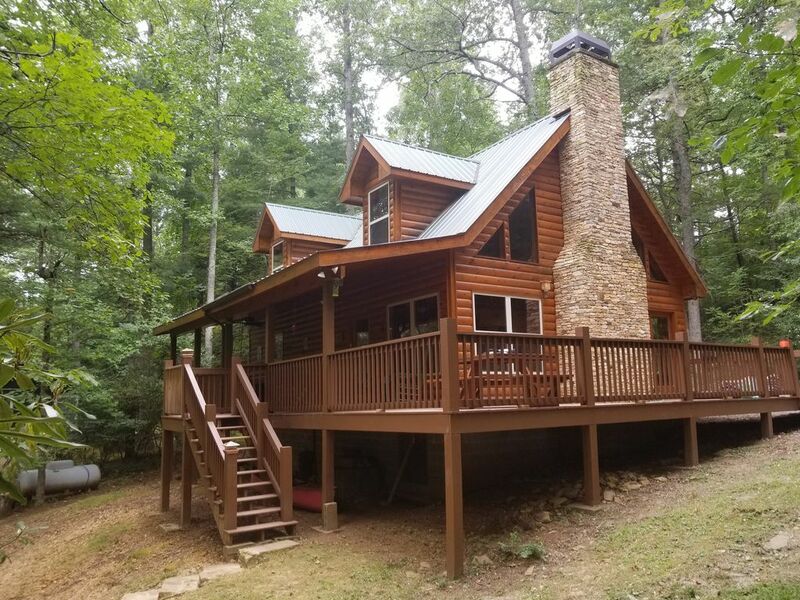 Whether You Are Looking for an Active Outdoor Adventure or Just Simply a Relaxing Getaway from the Day to Day Routine of Your Busy Life Kay’S Kabin Will Provide You and Yours the Perfect Starting Point for Your “Valley Above the Clouds” Vacation as You Explore All that Beautiful Suches, GA and the Surrounding Areas Have to Offer. The Cabin benefits: Appalachian Trail just out the front door. The Hammock, I can't explain it, you just have to experience it yourself. Memories made around 'The Fire Pit', and early morning coffee while gazing at the fish are unique benefits that our cabin offers. Canoe, Hammock, Fire Pit, Spring fed trout pond, Fishing poles, Catch and eat or Catch and release. The cabin was lovely- warm pine woodwork and spectacular tiles in the bathrooms, especially THE BEAR! It was dark and chilly by the time we arrived, so the heated bathroom floor was a real treat, once we got it going. We also started a fire right away, which completed the cabin atmosphere. The complementary firewood was a generous gift from the host.The central location to so many state parks put us in the difficult position of having to choose which to go see. Coming back into Suches by Rte 60 required real concentration on the part of the driver, but the rest of us enjoyed the view. I just wish the roadway had been wide enough for a few scenic overlooks. We all enjoyed feeding the trout and listening to the owls at night. If it had been warmer I'm sure we would have spent more time on the inviting porch. We did make good use of the fire pit, with a hotdog dinner one night followed by s'mores. The kitchen was well stocked with cookware and utensils, (though a pitcher for making sweet tea would have been nice.) Just a few other suggestions...The floor of the upstairs shower is a little slippery; a shower mat might make people a little more comfortable. Some curtains or blinds in the upstairs bedroom to block the neighbors view would help people who are sensitive about their privacy. All in all, we thank the owners for sharing their special mountain get- away. We stayed two nights, very clean. Great Cabin. Very clean and well stocked. We absolutely loved staying here, and will definitely be visiting again. The entire property is gorgeous, including the little pond in the back with the bonfire pit just beyond the back deck. The inside of this place was just stunning as well. Everything you could ever need while on vacation was supplied here. Everyone was raving over the downstairs shower too. STUNNING! The only issue we had was the water pressure if both showers were going at the same time. There would be no water coming out of the upstairs shower and you would lose your hot water upstairs. Because we had teenagers with us, it was hard to coordinate showers. The parking is kind of quirky, but that comes with being on a mountain. Other than that, I would recommend this place to everyone I know ten times over! Thanks so much! We cant wait to plan another trip. Wonderful cabin! Our family of 4 enjoyed our time away at this mountain top retreat. Close enough to Dahlonega and other surroundings for day trips. Quiet neighborhood. Fun little trout pond in the back. Stocked with necessities. Pots, pans, dishes, etc. very clean. Thank you, I'm so glad that you enjoyed your stay.